When you really want to "Be At The Beach", come visit our gorgeous, well appointed, first floor condo. Soak in the breathtaking oceanfront views from the comfort of your own beach balcony, equipped with luxury outside lounge chairs. Paradise awaits you with the beach just footsteps away, along with a heated pool and hot tub at your doorstep. Come see why this condo will become your home away from home. PROPERTY RULES: NO SMOKING - NO PETS. Primary guest must be 25 years of age. ID required at check in. 2 cars allowed per unit. ALL BOOKINGS IN JUNE AND JULY MUST BE SATURDAY TO SATURDAY ONLY. COMPLETE AMENITY LIST: Air Conditioning, Armchair, Balcony, Bathtub, Cable TV, Ceiling Fans, Chairs, Closet, Coffee Table, Coffeemaker, Cooking Utensils, Cooking Ware, DVD Player, Dining Room, Dishware, Dishwasher, Dresser, Dryer, Electric Stove, Elevator in Building, Fan, Free Wi-Fi, Free parking, Free parking with garage, Freezer, Garage, Hangers, Heated Pool, Heating, Ice Maker, Internet, Iron, Ironing Board, Kitchen, Lamps, Linens Provided, Microwave, Nightstand, Outdoor Pool, Oven, Parking, Refrigerator, Shower, Sink, Sofa, TV, Table, Table Utensils, Telephone, Toilet, Vacuum, Washing Machine, Wireless Internet LOCAL ACTIVITIES: Boating, Cinemas, Cycling, Deep Sea Fishing, Golfing, Shopping, Sightseeing, Surfing, Swimming, Wind Surfing WHAT'S NEARBY: ATM, Bank, Bars, Beauty Salons, Bowling, Grocery Store, Hospital, Marina, Massage Therapist, Museums, Public Beach, Restaurants, Shopping Mall, Spa, Theme Parks, Zoo Please note that a tax of 12.5% may not be charged by the booking site and will be collected upon arrival. Enjoy the Miraculous views at Ocean Walk! 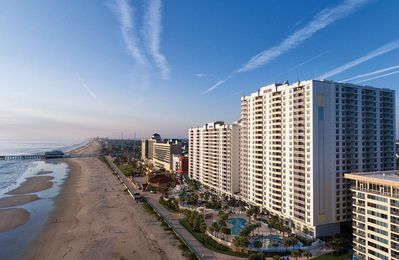 Weekly Rentals DIRECT OCEANFRONT 2 Bedrooms and 2 Bathrooms HEATED POOL 2 Charcoal Grills on Property (charcoal not supplied) PROPERTY RULES: No Smoking allowed in condo. Primary must be 25 years of age. 2 cars allowed per unit. ALL BOOKINGS IN JUNE AND JULY MUST BE SATURDAY TO SATURDAY ONLY. COMPLETE AMENITY LIST: Air Conditioning, Armchair, Balcony, Bathtub, Cable TV, Ceiling Fans, Chairs, Closet, Coffee Table, Coffeemaker, Cooking Utensils, Cooking Ware, Dining Room, Dishware, Dishwasher, Dresser, Dryer, Electric Stove, Elevator in Building, Fan, Free Wi-Fi, Free parking, Free parking with garage, Freezer, Garage, Hangers, Heated Pool, Heating, Ice Maker, Internet, Iron, Ironing Board, Kitchen, Lamps, Linens Provided, Microwave, Nightstand, Outdoor Pool, Oven, Parking, Refrigerator, Shower, Sink, Sofa, TV, Table, Table Utensils, Telephone, Toilet, Vacuum, Washing Machine, Wireless Internet LOCAL ACTIVITIES: Boating, Cinemas, Cycling, Deep Sea Fishing, Golfing, Shopping, Sightseeing, Surfing, Swimming, Wind Surfing WHAT'S NEARBY: ATM, Bank, Bars, Beauty Salons, Bowling, Grocery Store, Hospital, Marina, Massage Therapist, Museums, Public Beach, Restaurants, Shopping Mall, Spa, Theme Parks, Zoo Please note that a tax of 12.5% may not be charged by the booking site and will be collected upon arrival. Absolutely gorgeous direct ocean front unit. Professionally decorated 2 bedroom 2 bath located on the 6th floor. Bathrooms just remodeled with new fixtures, ceramic tile and granite countertops. Spectacular views. 70 minutes from Disney. 50 minutes from Kennedy Space Center. All linens included. Fully equipped kitchen. Large balcony with access from master bedroom and living room. 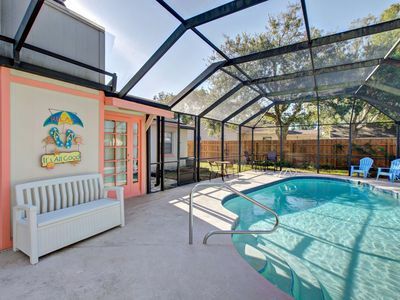 Amenities & Area: Phone, Air Conditioning, Cable TV, VCR, Stereo, CD Player, Full Kitchen, Microwave, Dishwasher, Refrigerator, Ice Maker, Cooking utensils provided, Linens provided, Sauna, Pool (shared), No Smoking Private Full size washer and dryer. Complimentary Wi-Fi in the Unit. Close to shopping and other attractions. Activities & Attractions: Biking, Golf, Tennis, Basketball, Fitness Center, Shuffleboard, Miniature golf, Amusement Parks, Fishing, Shopping, Restaurants, Cinemas, Museums, Sightseeing, Swimming, Snorkeling/Diving, Boating, Sailing, Waterskiing, Surfing, Windsurfing, Parasailing, Jet Skiing, Shelling Tennis and basketball courts are located onsite. Near all major attractions. 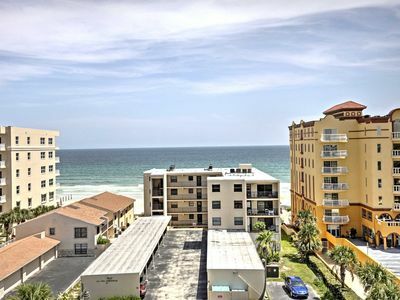 Daytona Beach, FL: 1 Bedroom Condo w/Beach, Resort Pools, WiFi & More! WHY STAY HERE Come and see for yourself why Wyndham Ocean Walk vacation resort is the best choice for your next Daytona Beach getaway. Available one, two and three-bedroom condos can accommodate the whole family or a couple who want to enjoy stunning ocean views, great amenities and tons of activities. Just steps from Daytona Beach, adjacent to Ocean Walk Village, the Daytona Bandshell and Main Street Pier. 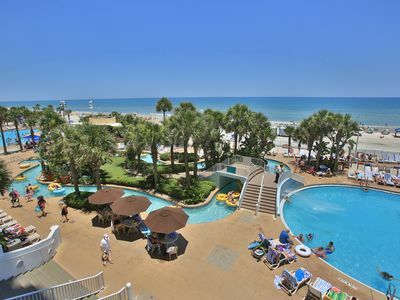 RESORT INFORMATION Wyndham Ocean Walk is the perfect beachfront vacation resort escape. The resort offers exceptional amenities and leisure comforts for the whole family to enjoy. The resort offers an indoor and outdoor heated pool, relaxing lazy river and exhilerating water slide. The fitness center features state of the art work-out machines, free weights and even a variety of health classes. Daily housekeeping is not included and may be added for a nominal fee: Other amenities and services offered include: - Two Outdoor Swimming Pools - Two Heated Indoor Swimming Pools - Lazy River & Water Slide - Business Center - Fitness Center - Fitness & Health Classes - Local Golf Courses- Book tee times now on GolfNow.com - Indoor & Outdoor Mini Golf Course - Gift Shop - Game Room - Pool Table - Activities Center - Concierge Tour Desk - Coffee Shop - Ocean Walk Eatery - Social Hours - Video Rental Kiosk - High Speed Wireless Internet (lobby) - 250 Guest Grand Ballroom - ATM Machine - 24-Hour Front Desk - Free Parking (only one space available for each suite rental). - Additional Parking: For a fee there is a parking garage across the street with covered walkway to resort. 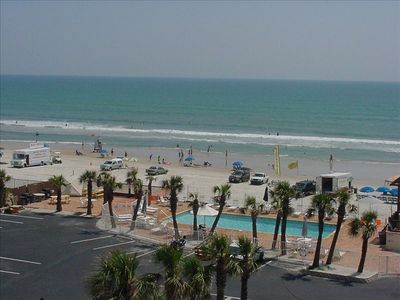 - Boat and Trailer Parking: Not available in on-site parking garage ABOUT THE AREA Wyndham Ocean Walk guests have easy access to the best of Daytona Beach. Enjoy the NASCAR Daytona International Speedway only five miles away. The Ocean Center Convention Center and Ocean Walk Shoppes located right next door. Universities close by include Embry Riddle University, Bethune Cookman College and the University of Florida Daytona Beach. NEARBY ATTRACTIONS: - Congo River Miniature Golf - 2.5 miles - Daytona International Speedway - 5 miles - Kennedy Space Center - 62 miles - Ocean Center Convention Center - 0.2 miles - Peabody Auditorium - 0.3 miles - LPGA Golf - 9.4 miles - St. Augustine - 54 miles - Walt Disney World ® Resort - 68 miles - Universal Orlando Resort - 67 miles OTHER THINGS TO KNOW - This resort offers handicap parking and first floor access ramps. - There is a mandatory resort fee for reservations at the resort in amount of $25.00 per reservation. The resort fee, which is imposed by the property owners associations at the resort, will be collected at the time of check-in. This resort may offer rooms with these special needs features: - Some units include wider than typical unit interior doorways, lever handles on all doors, counter-height microwave, front control stove or range, roll-under kitchen sink, roll-in shower, handheld shower head, grab bars in shower, grab bars in tub, grab bars around toilet, raised toilet (higher than typical units), front door wide-angle wheelchair height peephole, first floor handicap accessible access and Braille signage for room numbers. - Some units include visual doorbells, visual fire alarm, visual phone alert and closed captioned TV. Note: Only the person whose name is on the reservatoin will be allowed to check in. We are unable to change or add additional names. 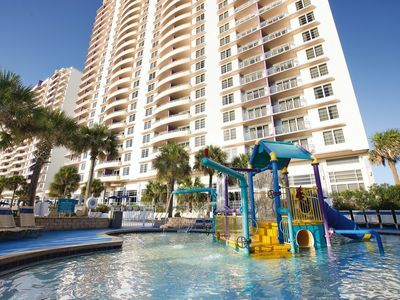 WHY STAY HERE Come and see for yourself why Wyndham Ocean Walk vacation resort is the best choice for your next Daytona Beach getaway. Available one, two and three-bedroom condos can accommodate the whole family or a couple who want to enjoy stunning ocean views, great amenities and tons of activities. 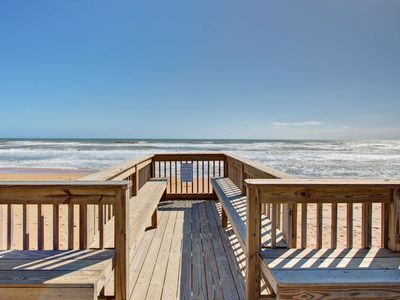 Just steps from Daytona Beach, adjacent to Ocean Walk Village, the Daytona Bandshell and Main Street Pier. ABOUT THE SPACE This is a perfect place to relax after an exciting day or night exploring Daytona Beach and all it has to offer. The one-bedroom condo offers a private bedroom with plush bedding, mini kitchenette and washer/dryer to make your stay comfortable. These vacation condos easily accommodate up to four guests. Amenities: - Master Bedroom with One King Bed or Two Double Beds - Separate Living Area - One Bathroom - Private Balcony (some units) - Queen-Size Sleeper Sofa - Washer & Dryer - Mini Kitchen with coffee and tea maker, microwave, refrigerator, dishwasher, toaster, flatware - Convenient Comforts include cable TV, hairdryer, DVD player, AM/FM alarm clock, CD player, iron and ironing board RESORT INFORMATION Wyndham Ocean Walk is the perfect beachfront vacation resort escape. The resort offers exceptional amenities and leisure comforts for the whole family to enjoy. The resort offers an indoor and outdoor heated pool, relaxing lazy river and exhilerating water slide. The fitness center features state of the art work-out machines, free weights and even a variety of health classes. Daily housekeeping is not included and may be added for a nominal fee: Other amenities and services offered include: - Two Outdoor Swimming Pools - Two Heated Indoor Swimming Pools - Lazy River & Water Slide - Business Center - Fitness Center - Fitness & Health Classes - Local Golf Courses- Book tee times now on GolfNow.com - Indoor & Outdoor Mini Golf Course - Gift Shop - Game Room - Pool Table - Activities Center - Concierge Tour Desk - Coffee Shop - Ocean Walk Eatery - Social Hours - Video Rental Kiosk - High Speed Wireless Internet (lobby) - 250 Guest Grand Ballroom - ATM Machine - 24-Hour Front Desk - Free Parking (only one space available for each suite rental). - Additional Parking: For a fee there is a parking garage across the street with covered walkway to resort. 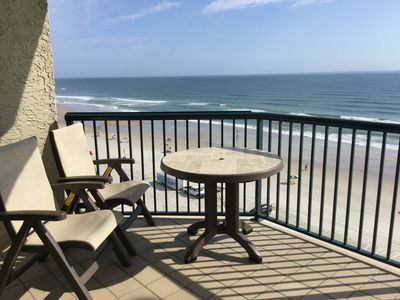 - Boat and Trailer Parking: Not available in on-site parking garage ABOUT THE AREA Wyndham Ocean Walk guests have easy access to the best of Daytona Beach. Enjoy the NASCAR Daytona International Speedway only five miles away. The Ocean Center Convention Center and Ocean Walk Shoppes located right next door. Universities close by include Embry Riddle University, Bethune Cookman College and the University of Florida Daytona Beach. NEARBY ATTRACTIONS: - Congo River Miniature Golf - 2.5 miles - Daytona International Speedway - 5 miles - Kennedy Space Center - 62 miles - Ocean Center Convention Center - 0.2 miles - Peabody Auditorium - 0.3 miles - LPGA Golf - 9.4 miles - St. Augustine - 54 miles - Walt Disney World ® Resort - 68 miles - Universal Orlando Resort - 67 miles OTHER THINGS TO KNOW - This resort offers handicap parking and first floor access ramps. - There is a mandatory resort fee for reservations at the resort in amount of $25.00 per reservation. The resort fee, which is imposed by the property owners associations at the resort, will be collected at the time of check-in. This resort may offer rooms with these special needs features: - Some units include wider than typical unit interior doorways, lever handles on all doors, counter-height microwave, front control stove or range, roll-under kitchen sink, roll-in shower, handheld shower head, grab bars in shower, grab bars in tub, grab bars around toilet, raised toilet (higher than typical units), front door wide-angle wheelchair height peephole, first floor handicap accessible access and Braille signage for room numbers. - Some units include visual doorbells, visual fire alarm, visual phone alert and closed captioned TV. Rates subject to change. Click "Book it Now" for rates and availability. 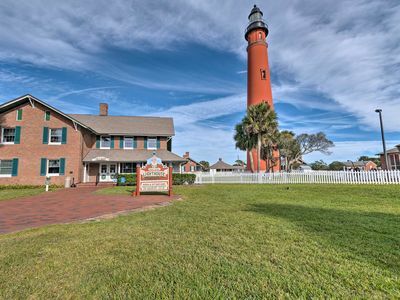 The Inlet is perfectly positioned at the northern tip of the beach to provide you with panoramic views of the ocean, the inlet, turtle dunes, rock pier, and lighthouse. Look no further...this is your getaway vacation! The Inlet is part of the secured, gated community of Minorca, the most prestigious resort in the area. Enjoy your amazing views from the master bedroom balcony, or from the living room balcony. Prvt Beach Access, Prvt Pool, Fire Pit, Huge Balcony with Direct Ocean Views, Sm Dog OK - FREE WiFi! Our Studio suites accommodate four and feature flat screen TV's, premium bedding and linens, daily housekeeping, kitchenettes with a two-burner stove top, blender, coffee maker, mini-refrigerator and microwave. All suites have free Wi-Fi access. Bathrooms have Bath & Body Works® soaps and a hair dryer. No pets and no smoking. Resort sits directly on the beach. 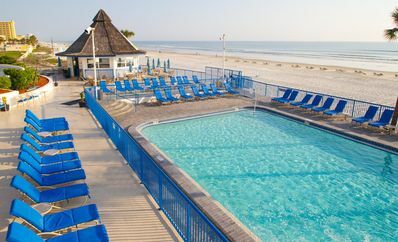 Guests walk across pool deck and have direct access to the beaches of Daytona Beach Florida Service animals are allowed any place or area that the public is allowed. The service animal is not required to have a vest or tag, but it must be leashed, harnessed or tethered unless such an item would interfere with the dog’s ability to perform the task or work to assist the disabled person. Even without these items, the dog must remain in the control of its owner by voice, signal or other effective commands, and in the presence of the owner at all times. Service animal owners will be charged the same fees charged to other customers. Violation of this policy could result in the party being asked to secure alternate accommodations at their own expense. Walk the Walk at Ocean Walk! Minimum 2 Week Rental Great Ocean & River Views PROPERTY RULES: No Smoking allowed in condo. No pets. Primary guest must be 25 years of age. 2 cars allowed per unit. ID required at check in. COMPLETE AMENITY LIST: Air Conditioning, Armchair, Balcony, Bathtub, Cable TV, Ceiling Fans, Chairs, Closet, Coffee Table, Coffeemaker, Cooking Utensils, Cooking Ware, Dining Room, Dishware, Dishwasher, Dresser, Dryer, Electric Stove, Elevator in Building, Fan, Free Wi-Fi, Free parking, Free parking with garage, Freezer, Garage, Hangers, Heated Pool, Heating, Ice Maker, Internet, Iron, Ironing Board, Kitchen, Lamps, Linens Provided, Microwave, Nightstand, Outdoor Pool, Oven, Parking, Refrigerator, Shower, Sink, Sofa, TV, Table, Table Utensils, Telephone, Toilet, Vacuum, Washing Machine, Wireless Internet LOCAL ACTIVITIES: Boating, Cinemas, Cycling, Deep Sea Fishing, Golfing, Shopping, Sightseeing, Surfing, Swimming, Wind Surfing WHAT'S NEARBY: ATM, Bank, Bars, Beauty Salons, Bowling, Grocery Store, Hospital, Marina, Massage Therapist, Museums, Public Beach, Restaurants, Shopping Mall, Spa, Theme Parks, Zoo Please note that a tax of 12.5% may not be charged by the booking site and will be collected upon arrival. 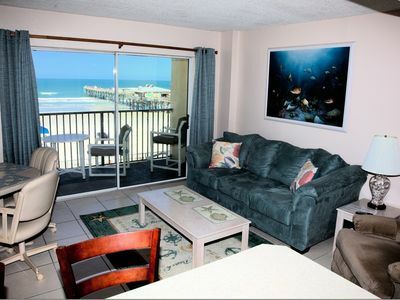 Oceanfront Studio - 10 Mins to Downtown Daytona! I can accept a 1-night stay for a weekend night if the date is within 14 days. Otherwise, Friday or Saturday nights are a mandatory 2-night minimum stay meaning: Thursday/Friday, Friday/Saturday, or Saturday/Sunday. Two Bedroom Penthouse: King in master, two full beds in second bedroom, sleeper sofa in living area. Maximum occupancy 6. ***Please review ALL details in each field*** The Resort maintains a high standard through its maintenance, upgrade, and refurbishment program. As a result the unit characteristics may change from time to time and vary. When you check into the resort, the front desk will require a $150 security deposit hold against a credit/debit card in case any major damage should occur. The security deposit will be released back to you on the day of departure. ABSOLUTELY NO PETS ALLOWED! If you have a service animal, you must let us know in writing prior to booking. Beachside Mansion is an enormous 7 bedroom historic home is situated in the heart of Daytona Beach and is a short walk to everything you'd want to see or do on beachside, including the Ocean Center, the Boardwalk, the beach itself, Restaurants and Nightlife. With so many bedrooms, this property accommodates really big groups and/or multiple families so you can save money and enjoying being in the same property together. Everything is new inside, from fixtures to furniture, and the decorations are absolutely beautiful. The mattresses are ultra comfortable and all the little details will make this an ideal vacation rental home for your big group of guests. Studio condo opens directly to a grassy sun deck which leads to the pool and Tiki bar. There are only 9 units that have this direct access. Parrot Cay has two full beds and a single convertible chair/bed, recliner, table for two, wet bar (sink, coffee maker, microwave, mini fridge). Walking distance to dining/shopping/events with the new Jimmy Buffet Landshark Bar and Grill just a one mile walk north on the beach. Ocean Deck (Beach Tiki Bar & Restaurant), Daytona Beach Pier & Bandshell along with Oceanwalks are all less than a 2 mile walk north on the beach. Public transportation and share riding services are very cost effective if you prefer not to get sand between your toes. NEW! 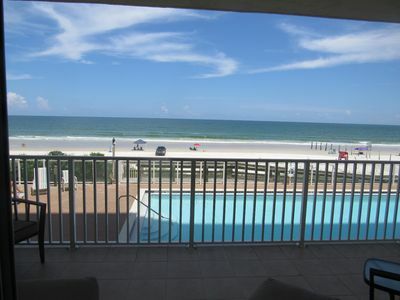 Condo w/Breezeway - 1 Block to Daytona Beach! Beautiful newly remodeled 1 Bedroom, Direct Ocean Front, Wyndham Ocean Walk! 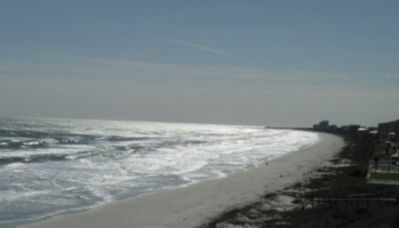 Private Beach Resort Amenities Included, Ocean, Lighthouse, Beach Views! Stay at this fabulous Newly Redecorated Direct Ocean Front Luxury Beach Resort Condo with your family or a group of friends (up to 6 guests) and you will wish this was your permanent home. Enjoy an incredible beach getaway which includes access to all resort amenities. Breathtaking panoramic Ocean, Inter-Coastal, Ponce Inlet & Lighthouse views enhance the extravagant atmosphere of this condo. New furniture, paint, bedding, high quality spa linens, original artwork, Smart TVs, Private High Speed Internet WiFi, large full size washer & dryer & more make this a perfect spot to make yourself at home and truly relax and enjoy your vacation. Everything you need for the beach is here: chairs, towels & a large cooler. After a long & fun day playing in the sun, cozy up on the new sofas for a quiet night in enjoying the huge flat screen TV's & DVD player to watch your favorite movies. Access your personal Netflix, Hulu, Amazon accounts & more to catch up on all your personal favorites, start where you left off at home! Across the room is a dining table for six, perfect for game nights & family meals together. There are many games stocked in the condo for all ages. The large eat-in kitchen with a large cook island makes it easy to prepare and serve meals for the entire group or set out a party buffet for entertaining. Whether you're making a full holiday meal or a quick breakfast before catching your dolphin-watching excursion, the major appliances plus the microwave, coffeemaker, and dishwasher make it all a breeze. The master bedroom suite features a king-size bed & breathtaking views of the Ocean & Inlet from the ceiling to floor glass wall; which opens out to an oversized private balcony. Wake up to the sun coming over the water or close the room darkening verticals and sleep as long as you like, it's your Vacay! The master suite includes double vanity sinks, large shower (awesome shower massage, very high pressure, feels fantastic on your shoulders and back), large walk-in closet, private toilet room & plenty of mirrors for dressing and reflecting all the light and outside views. From the master bedroom, you can step out onto the balcony to read a book or drink a cup of coffee while the sun rises before you. Spend some time reflecting on the beauty and power of the constant surf. Enjoy your favorite beverage in the evening and watch the ever-present light circle around from the Ponce Inlet Lighthouse. The second bedroom has a new queen bed & a new bunk bed (2 twins). Ceiling mounted Smart TV makes it easy for all to enjoy their favorite shows. The views from the second bedroom are of the beach, resort tennis & pool areas, clubhouse and the beautifully landscaped grounds of The Inlet Resort. There is a bathroom off the second bedroom with shower/tub combo, new fixtures, mirror, lighting, high quality linens & spa towels. It's accessible by the hallway, as well. ?????? ?This condo includes a private parking space located directly by the elevator in the underground-protected garage making it very convenient to unload your groceries and luggage right by the elevator, no matter the weather. The Inlet Resort is nothing short of incredible. 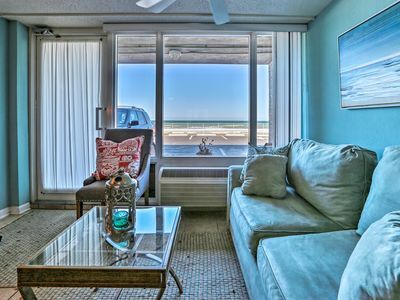 This luxury condo is located on the 6th floor with easy access to multiple pools, hot tubs, a private beach pavilion with direct access to the beach for surfing, sunbathing, swimming, biking, surf fishing, walking & beach combing. The resort property itself boasts excellent tennis court facilities, fitness center, sauna and clubhouse. There is a fishing dock and access to the Dunes State Park; which is an eco-system sanctuary for many native plants & animals including the large gopher tortoise. There are many local shops, boutiques, pubs, art galleries, spas & restaurants just a short car ride away along Flagler Ave. & Canal St. Bright Daytona Home-Steps to Beach, Near Speedway! We are new to homeaway but have a 5star rating with over 100 reviews on Airbnb. 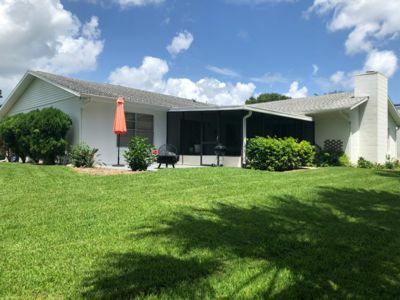 Ranch style Florida 3 bedroom, 2 full bath, 2 car garage on a quiet dead-end street right off the cul-de-sac. We have a nice sized front yard, off-street parking for 3 cars, and a big backyard. 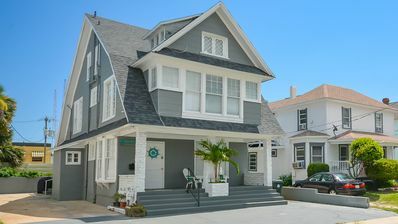 We are a 10 minute drive to the beach/pier and about 20 minutes to a premiere secluded beach area. Grocery stores, Target etc are all within 5 mins. Follow our Instagram @sunshinestaysfl to learn more about our home and things to do in the area, tips and trips to living like a local, and our secret spots. Enjoy all 1576 sq. 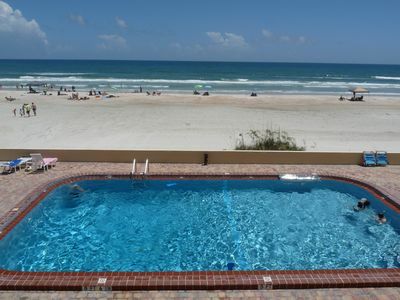 ft. of this lovely 3br/2 full bath vacation home at the world famous Daytona Beach. 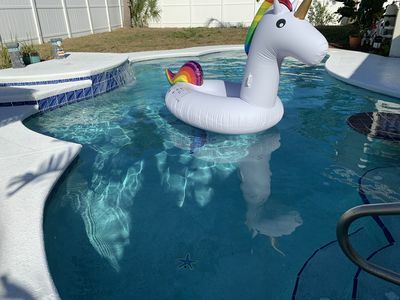 Cross Atlantic ae to enjoy the beautiful beach and enjoy a quick dip in the pool or just relax out back and listen to the ocean right in the back yard. Have fun paying a game of pool or a quick walk the put put golf. There is so much to do here in Daytona beach fishing nearby great restaurants, movies, fine dining and much more! ?? VACATION AT THE BEACH WITH ALL THE COMFORTS OF HOME!!! ?? ?? Proud recipients of the TA 2017 & 2018 CERTIFICATE of EXCELLENCE!!! ?? - The Certificate of Excellence is given annually to those properties that provide consistently outstanding experiences and whose owners offer first-class customer service to their guests. We always strive to provide great customer service. It’s great to be rewarded after all of our hard work and it’s wonderful to know that our many guests over the last year have really valued their stay. 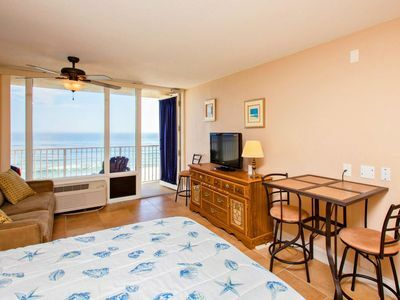 Our condo unit is a DIRECT OCEANFRONT spacious 2 bedroom/2 bath second floor unit. 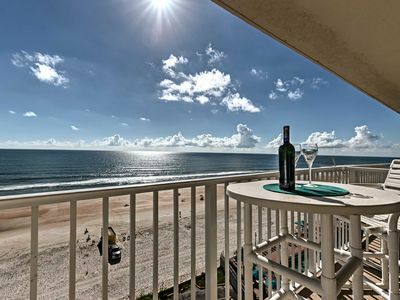 Watch the sunrise from the LARGE PRIVATE OCEANFRONT BALCONY in this very comfortable condo. As soon as you walk in you will feel relaxed. This unit is a direct oceanfront unit offering a beautiful view of the beach and beach-side pool directly below from the living room and master bedroom. You can watch dolphins play in the water, pelicans fly by, or just enjoy the beautiful waves. 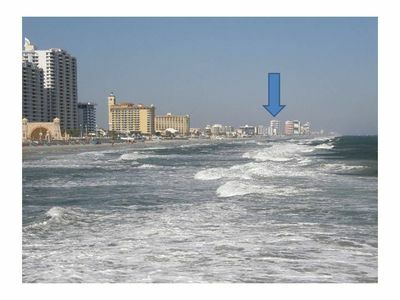 The beach is just footsteps away from the condo which is located directly on the NO DRIVE ZONE portion of Daytona beach. 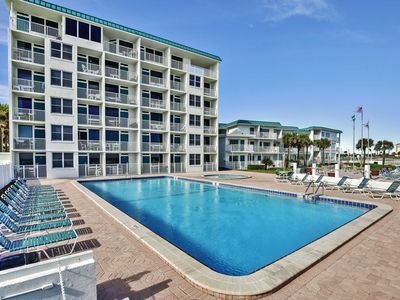 The Sea Fern condominium is located on a small peninsula of land between the Atlantic Ocean and the Halifax River at 3807 South Atlantic ave., Daytona Beach shores. We rent by the WEEK (SATURDAY to SATURDAY) and your rental period can extend multiple weeks or months depending on availability. Our rental periods go from Saturday to Saturday, however you are welcome to stay anytime within the rental period if you decide you want to stay less than the full rental period. For example: You can arrive on Sunday and depart on Friday if you so desire. Late arrival and early departure is always quick and easy with our key-less locks (you just need the provided access code to check-in anytime after your check-in time and no worries about lost keys) and easy to follow departure checklist. We also have a 3rd floor (Listing#3804046) and 5th floor (Listing#4109647) unit at Sea Fern. All our condo units are 2 bedroom/2 bath direct oceanfront units with beautiful ocean views from the living room and master bedroom which open up onto large private oceanfront balconies. Please check them out at the listing numbers above and we will be happy to answer any questions you have about any of our rental units. 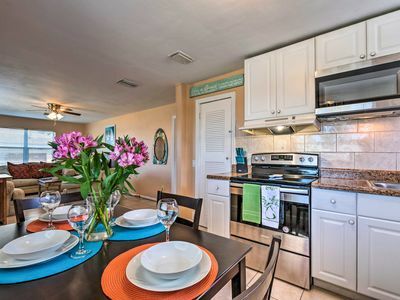 This is not your typical small 2 bedroom condo you'll find elsewhere in Daytona Beach. This SPACIOUS condo (over 1400 sq-ft) has 2 full baths, living room, separate dining area, a FULL KITCHEN, a full size WASHER and DRYER, and ceiling fans with light kits in the bedrooms and living room. The large master suite has a QUEEN BED and en suite private master bathroom with walk-in shower with floor to ceiling sliding glass doors that open to the oceanfront balcony, for an amazing oceanfront view. The second bedroom contains TWO TWIN BEDS with its own full size bathroom in the hall. The unit has a QUEEN SLEEPER SOFA-BED allowing the unit to comfortably accommodate 6 people. Our condo units are DOG FRIENDLY!! We are happy to allow our guest's canine companions to stay with them on their vacation. Up to two, well behaved, non-aggressive, housebroken dogs (1 year of age or older, no puppies) are welcome to accompany our guests during their stay with us. We do not permit cats (due to family allergies) or any other pets. All utilities are included during your stay. We provide an ELECTRIC GRILL for your grilling pleasure on our large, private, oceanfront balcony. We have a ROKU HDTV in the living room providing you almost unlimited streaming content at your fingertips in addition to traditional digital cable service. We provide free access to NETFLIX as well as several other streaming channels giving you access to hours of ON DEMAND entertainment when your not out enjoying the beach. Digital cable TV is provided in the living room and both bedrooms with a DVD player in the living room. FREE LOCAL AND LONG DISTANCE CALLS within the United States, Canada, and Puerto Rico is provided for your benefit. There is even FREE HIGH-SPEED WIRELESS INTERNET (WiFi), so bring your laptop computer. Our condo includes ALL THE COMFORTS OF HOME, as it is FULLY EQUIPPED with EVERYTHING you need from silverware, to linens, to beach chairs and towels. We even provide you your initial soap, paper towels, toilet paper, detergent, and dryer sheets so that you can start relaxing as soon as you walk in the door. 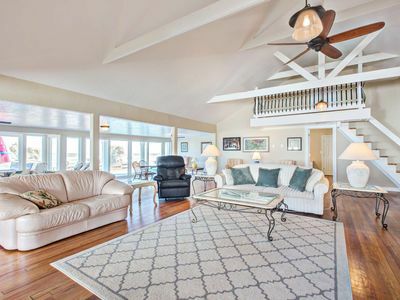 The master Suite and living room have floor to ceiling sliding glass doors that open to the oceanfront balcony, for an amazing oceanfront view. A RESERVED COVERED PARKING SPACE is provided. There is additional parking in front of the building for your guests. The 2nd floor unit is level with the parking in front of the building and only a quick walk or elevator ride down one floor to the beach. There is an OCEANFRONT POOL with adjacent sunning deck. The building only has 19 units ensuring that you will be able to fully enjoy them without worrying about crowds. There is plenty to do, including golf cart, ATV, and bike rentals on the beach, as well as surfboard rentals. 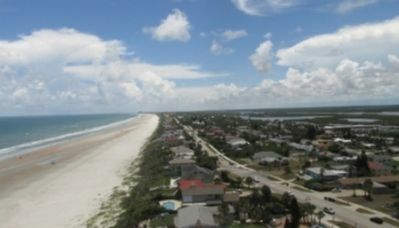 There are also jet ski rentals and parasailing at Ponce Inlet, just a short drive South. You can stroll to the local pier for breakfast, lunch, dinner, or fishing. 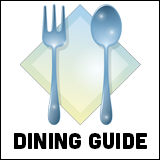 There are also numerous restaurants in the immediate area, some with fresh seafood and live music. There are various miniature golf sites nearby, as well as a water park, go-carts, amusement center at the boardwalk, shopping, parasailing, etc. Your home away from home is 60 minutes from Disney World, Sea World, Universal Studios, and Kennedy Space Center. Daytona Beach Airport and Daytona Speedway are 20 minutes away. You will positively want to return year after year. 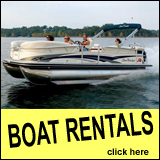 We rent weekly and monthly (Saturday to Saturday). Available for multi-month rentals. WE PROVIDE DISCOUNTS ON EXTENDED STAYS. 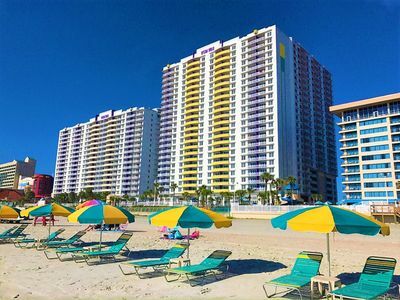 The longer you stay with us the more you save on your Daytona Beach Vacation!!! Stay 2 weeks & we'll take $50 Off your stay! Stay 3 weeks & we'll take $100 Off your stay! Our monthly (4 week) rates are $200 Off our standard weekly rates! (Example: weekly rates $599 + $599 + $599 + $599 = $2399, with monthly discount $2199/month) Stay 2 or more months and we will further discount our already discounted monthly rates by another $200/month. (Example: Regular monthly rate $2199/month, with multi-month discount $1999/month). Check-in: 5:00pm - Check-out: 10:00am (Saturday to Saturday). Rental Policies: 12.5% Volusia County/State Tax will be added to standard weekly/monthly rate. Damage/Reservation Deposit: $300 - weekly rental*; $500 - monthly rental (refundable within two weeks after stay if no damage). Due at time of reservation. Nonrefundable if reservation is cancelled less than 60 days prior to scheduled arrival. *The damage/reservation deposit is $500 for international renters. Pet Damage Deposit: Up to two, well behaved, non-aggressive, housebroken dogs (1 year of age or older, no puppies) are allowed. An additional $100 deposit/dog will be required which is refundable if no damage. We do not permit cats (due to family allergies) or any other pets. Cleaning Fee: $100 - weekly rental; $150 - monthly rental. Pet Fee: $100 per stay (only applied to guests bringing their canine companions with them). Taxes and fees are considered part of the rent and are only refundable with reservation cancellation based on the cancellation policy below. Advance Payment: equal to 50% of the rental rate is required to confirm reservation. Advance payment will be applied toward the property rental price. Balance due in full 30 days prior to arrival for weekly rental and 60 days prior to arrival for monthly rentals. Cancellation Policy: Weekly Rentals (3 weeks or less): A sixty (60) day notice in writing is required for cancellation. Reservations which are canceled up to sixty (60) days prior to the Check-In date are fully refundable minus a $75 processing fee and booking fee if applicable. Cancellations that are made less than sixty (60) days prior to the Check-In date will forfeit the full damage/reservation deposit with refund of any additional pre-paid rental amount received minus booking fee if applicable. Cancellations or changes that result in a shortened stay, or are made within thirty (30) days of the Check-in date, forfeit the full advance payment, damage/reservation deposit, and any additional pre-paid rental amount receive up to the total rental cost. Cancellation or early departure does not warrant any refund of rent or deposit. Monthly Rentals (4 weeks or longer): A ninety (90) day notice in writing is required for cancellation. Reservations which are canceled up to ninety (90) days prior to the Check-In date are fully refundable minus a $75 processing fee and booking fee if applicable. Cancellations that are made less than ninety (90) days prior to the Check-In date will forfeit the full damage/reservation deposit with refund of any additional pre-paid rental amount received minus booking fee if applicable. Cancellations or changes that result in a shortened stay, or are made within sixty (60) days of the Check-in date, forfeit the full advance payment, damage/reservation deposit, and any additional pre-paid rental amount receive up to the total rental cost. Cancellation or early departure does not warrant any refund of rent or deposit. We always recommend that our guests obtain trip interruption/cancellation insurance in case they need to change their vacation plans within 60 days of arrival or during their stay for any reason. NEW! Ponce Inlet Home - Walk to the Lighthouse! Relax & Take-in the Spectacular OceanFront, 6th Floor Views! An Affordable Stay w/ FREE HBO & WIFI! 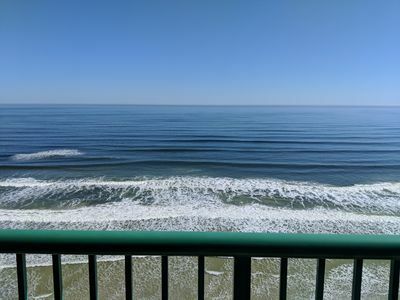 Daytona Beach in this 1 bedroom direct oceanfront condo located in the areas only Traffic Free beach right in the heart of Daytona. This condo features a separate living room, full service kitchen and 2 double beds. Enjoy the panoramic ocean views of this tastefully decorated unit from our kitchen, as you relax in the sitting area, or on our lovely balcony. You can walk to the Boardwalk, Main Street and the Ocean Walk Entertainment Center. The Ocean Walk Center has restaurants, night clubs, and movie theaters. Located on the corner of Atlantic ave and International Speedway you are in the center of all the fun activities Daytona Beach has to offer and only a few minutes from the track. 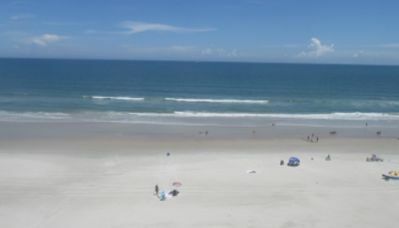 Call and let us help you have a wonderful and fun stay at Daytona Beach. I wanted to note at the end of the 2017 summer season Daytona was it with two hurricanes. You MAY see supplies and workers on site from time to time but there is no heavy construction occurring. Beautiful 2 bedroom 2 bath Condo on the 15th floor Wake up to a beautiful sunrise from your masterbedroom! 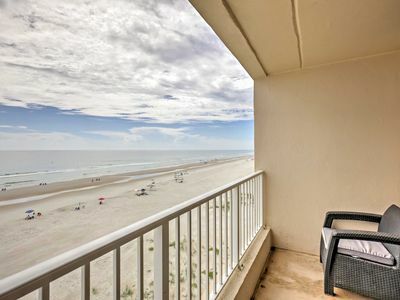 Enjoy coffee on your private direct oceanfront balcony. Balcony is accessible from the living room and the master bedroom. No streets to cross to get to the beach! 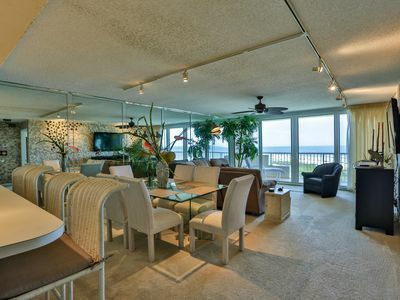 This beautiful condo is on the beach. Fully equipped kitchen and cocktail bar. Spacious rooms. Master bedroom has a king size bed. Guestroom features a queen size bed. The family room features a queen sleeper sofa. There are 4 large television. You will find lots of things to do in Daytona Beach. You are within minutes of countless adventures. Famous for our beaches and motorsports, there is an abundance of arts, culture and history, shopping, golfing and sports events. 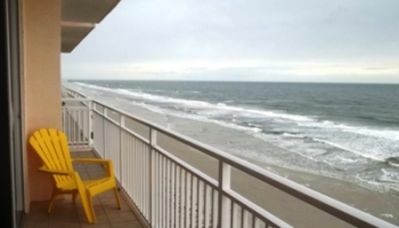 Weekly Rentals DIRECT OCEANFRONT 2 Bedrooms and 2 Bathrooms HEATED POOL 2 Charcoal Grills on Property (charcoal not supplied) PROPERTY RULES: No Smoking allowed in condo. Primary guest must be 25 years of age. 2 cars allowed per unit. ALL BOOKINGS IN JUNE AND JULY ARE SATURDAY TO SATURDAY ONLY COMPLETE AMENITY LIST: Air Conditioning, Armchair, Balcony, Bathtub, Cable TV, Ceiling Fans, Chairs, Closet, Coffee Table, Coffeemaker, Cooking Utensils, Cooking Ware, Dining Room, Dishware, Dishwasher, Dresser, Dryer, Electric Stove, Elevator in Building, Fan, Free Wi-Fi, Free parking, Free parking with garage, Freezer, Garage, Hangers, Heated Pool, Heating, Ice Maker, Internet, Iron, Ironing Board, Kitchen, Lamps, Linens Provided, Microwave, Nightstand, Outdoor Pool, Oven, Parking, Refrigerator, Shower, Sink, Sofa, TV, Table, Table Utensils, Telephone, Toilet, Vacuum, Washing Machine, Wireless Internet LOCAL ACTIVITIES: Boating, Cinemas, Cycling, Deep Sea Fishing, Golfing, Shopping, Sightseeing, Surfing, Swimming, Wind Surfing WHAT'S NEARBY: ATM, Bank, Bars, Beauty Salons, Bowling, Grocery Store, Hospital, Marina, Massage Therapist, Museums, Public Beach, Restaurants, Shopping Mall, Spa, Theme Parks, Zoo Please note that a tax of 12.5% may not be charged by the booking site and will be collected upon arrival. 804 Opus - Daytona Beach Shores - 3 Bedroom / 3 Bath - Direct Oceanfront - 2 King, 2 Queens - FREE WI FI PROPERTY RULES: No Smoking allowed in condo. Primary guest must be 25 years of age. 2 cars allowed per unit. ALL UNITS BOOKED IN JUNE AND JULY ARE SATURDAY TO SATURDAY ONLY. COMPLETE AMENITY LIST: Air Conditioning, Armchair, Balcony, Bathtub, Cable TV, Ceiling Fans, Chairs, Closet, Coffee Table, Coffeemaker, Cooking Utensils, Cooking Ware, DVD Player, Dining Room, Dishware, Dishwasher, Dresser, Dryer, Electric Stove, Elevator in Building, Fan, Free Wi-Fi, Free parking, Free parking with garage, Freezer, Garage, Hangers, Heated Pool, Heating, Ice Maker, Internet, Iron, Ironing Board, Kitchen, Lamps, Linens Provided, Microwave, Nightstand, Outdoor Pool, Oven, Parking, Refrigerator, Shower, Sink, Sofa, TV, Table, Table Utensils, Telephone, Toilet, Vacuum, Washing Machine, Wireless Internet LOCAL ACTIVITIES: Boating, Cinemas, Cycling, Deep Sea Fishing, Golfing, Shopping, Sightseeing, Surfing, Swimming, Wind Surfing WHAT'S NEARBY: ATM, Bank, Bars, Beauty Salons, Bowling, Grocery Store, Hospital, Marina, Massage Therapist, Museums, Public Beach, Restaurants, Shopping Mall, Spa, Theme Parks, Zoo Please note that a tax of 12.5% may not be charged by the booking site and will be collected upon arrival. 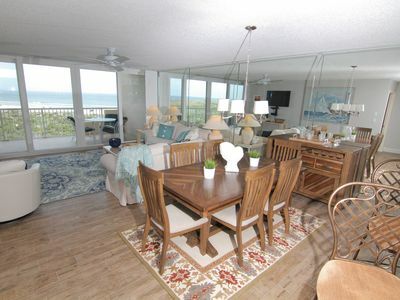 Georgeous Oceanfront 2 bed/2 bath condo with all the conveniences of home! 21st Floor Penthouse View! DIRECT OCEANFRONT! - 2347sf, 3Bd/3Ba, 44' Balcony! 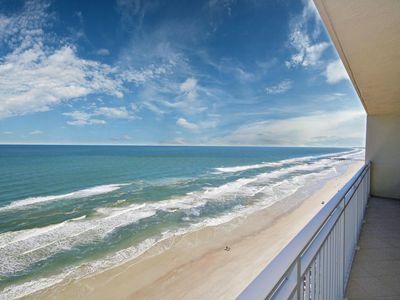 DIRECT OCEANFRONT - 2347sf, 3 Bedroom/3 Bath, 21st Floor 44' BALCONY! - Open floor plan condo with terra cotta tiles and many upgrades. Large kitchen with quartz countertops and stainless steel appliances. 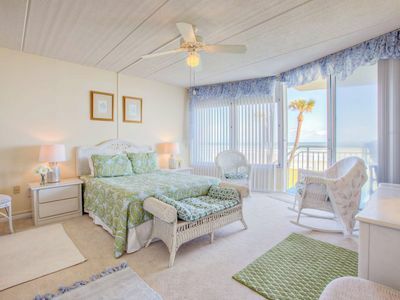 Master bedroom suite with oceanfront balcony, garden tub, shower, walk in closet, double vanity, and make-up table. Two additional spacious bedrooms with their own private bathrooms and large closets. Extras include: in-unit laundry room with additional storage, designer window dressings, humidistat, and hurricane shutters. 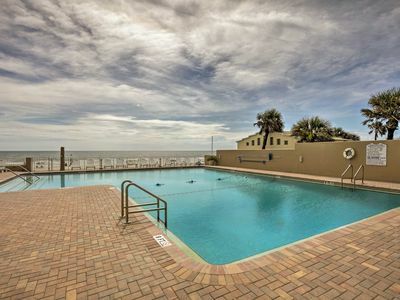 The Grand Coquina condo features, 1 indoor and 1 outdoor heated swimming pools, 1 spa/hot-tub, his and her steam rooms, library, a huge penthouse clubroom, 2 exercise rooms, parking garage, and an impeccable atrium lobby, all in a newly renovated building! 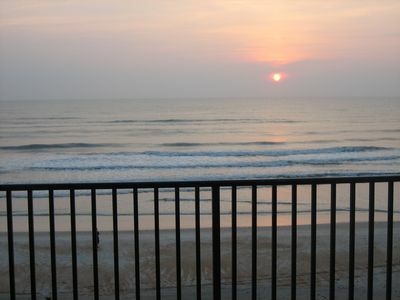 Wakeup to a shimmering sunrise and enjoy the breeze on your amazing 21st floor balcony overlooking the beautiful Atlantic ocean Daytona Beach Shores famous golden strand beach. 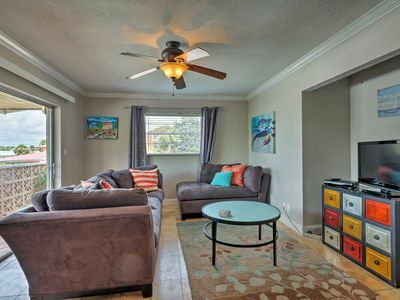 The 3/3 condo is immaculately maintained with new appliances, new AC, and new water heater. The unit also boasts spectacular sunset views of the Inter-coastal waterway. Entertain guests in the spacious kitchen, breakfast bar/nook, and wonderful dinning area, all with gorgeous views of the ocean. Enjoy your morning coffee on the expansive 44' balcony while watching the awe-inspiring sunrise over the ocean horizon. The master suite offers the same ocean views while the guest bedrooms feature beautiful sunset views over the river. When you decide to explore, you are only minutes from, fine dining, great shopping, Ponce Inlet lighthouse, and the world famous Daytona Beach International Speedway. Pirates Island Adventure Golf, The Bagel Cafe, a Quickie Mart, and CVS pharmacy are just 2 blocks away, and ABC Liquor is directly across the street. Basic cable and high-speed Internet with 5G Wi-Fi from Spectrum is included. Carpets, floors and showers recently professionally cleaned and sealed. 50" TV and Blu-ray player with apps in living room. 40" TV with apps in bedrooms. 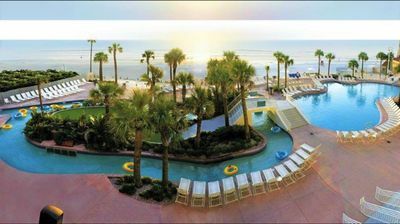 Oceanside Resort w/Free WiFi, Pool & Beach- 1BR- Steps From Attractions! We are the official and exclusive partner for Diamond Resorts. Only rent from official listings in order to ensure your reservation gets delivered to the resort and you receive the best possible guest experience at our properties. Book online now! 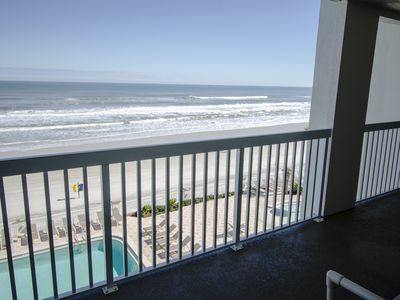 Daytona Beach Regency is the perfect location for a Florida beach vacation. 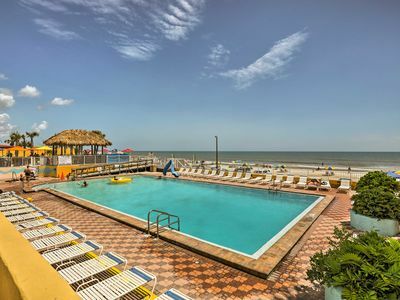 Just steps away from the boardwalk, this well-equipped, beachfront resort offers spacious accommodations, organized activities and an indoor and outdoor swimming complex complete with pools, whirlpools and waterslides. 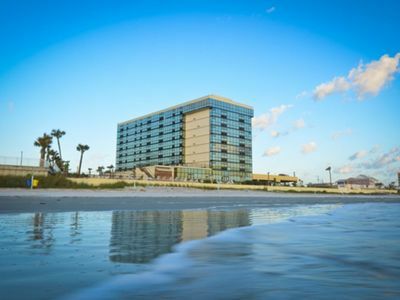 Relax on the white sandy shores of famous Daytona Beach and test your driving skills on the sand or at the nearby raceway attractions and spend your evenings perusing the Downtown Shopping District. This property charges a mandatory resort fee due at check-in. Please check listing below for details. Rates subject to change. ABOUT THE AREA Daytona Beach, Florida has all the beauty and appeal of a tropical paradise along with the exciting thrills of city night-life and theme parks. Spend an afternoon on the Boardwalk for fun-filled Ferris Wheel rides and rollercoasters, delicious food and snacks, and all sorts of other family-friendly activities. 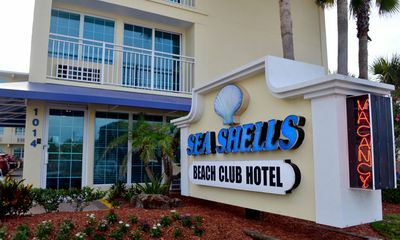 Cool off on the beautiful sandy beach- miles of sparkling waters and stunning seashells, just minutes from the resort. Dining, shopping, and exciting attractions are all just a few minutes’ walk away. Looking for something a little more active? Championship golf courses are a short ride away, and the Daytona Beach area offers tons of outdoor sports like fishing, boating, kayaking, surfing, hiking, biking, and much more! In the evening, stop by the city for some wining and dining, or tour the local bars for live music, good food, and great dancing. And, of course, don’t forget to stop by the Daytona International Speedway! This world-class mecca of motorsports features top-of-the-line racing facilities, ongoing championship races, and remains to this day the birthplace of many track legends and death-defying feats. 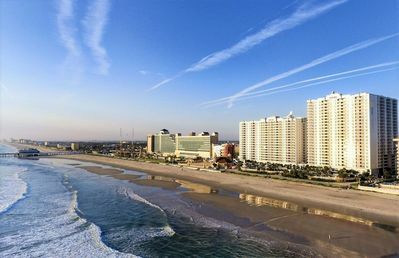 THINGS TO DO: - The Beach - steps away - Boardwalk- 0.8 miles away - Daytona Beach Main Street Pier - easy four block stroll south on the beach - Daytona Lagoon - 0.3 miles away - Congo River Miniature Golf - 2.6 miles away - Daytona Flea & Farmers Market – 7.5 miles away - Daytona International Speedway - 5.7 miles away - NASCAR - 5.8 miles away - Sea Spirit Deep Sea Fishing - 11.3 miles away - Ponce de Leon Inlet Lighthouse & Museum- 12 miles away - LPGA International Golf – 10.4 miles away WHY STAY HERE Nestled right up against the sandy shores of Daytona Beach, Florida, the Daytona Beach Regency combines the comfort and luxury of a world-class resort with all the excitement and adventure of the Daytona Beach area. Family-friendly and surrounded by the romantic atmosphere of pristine beaches and gorgeous ocean sunsets, this resort is the perfect getaway for families, couples, and everyone in-between. Enjoy spectacular views of the twinkling city-lights and the vastly beautiful Atlantic Ocean right from your private balcony. Head down to the sunny beaches for a day of splashing and surfing in the waves, head out to one of the nearby championship courses for a day on the green, stop by the Boardwalk for rollercoaster rides and delicious food, or stroll through the Downtown Shopping District for an unparalleled shopping experience. Grab a hand-crafted drink at the poolside and beach bars while the kids play in one of the beautiful outdoor pools or the gently rolling waves and enjoy all the wonderful on and off-site amenities knowing that you have a gorgeous, comfortable home away from home waiting for you at the end of the day. 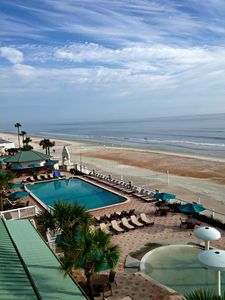 Come explore the wonders of Daytona Beach with Daytona Beach Regency, and experience a vacation you will never forget. ABOUT THE SPACE This One-Bedroom accommodation is a spacious 725 sq. ft. and can house up to four guests. The Master Bedroom features a plush queen-sized bed with a flat-screen TV and private access to both the bathroom and balcony. The bathroom features a luxurious garden tub and the balcony treats guests to gorgeous coastal views. Enjoy a homemade meal courtesy of the full kitchen- contains fridge, oven, stove, microwave, dishwasher, coffee maker, blender, toaster, silverware, dishes, and cookware- around the elegantly-set dining table. After dinner, feel free to relax in your spacious living area and enjoy a late-night movie on the flat-screen TV equipped with cable, satellite, stereo, and DVD Player. A queen sleeper sofa makes housing additional guests a breeze, and a washer and dryer are included in the unit for guests’ ultimate convenience. Other amenities provided for guests include: - Complimentary WiFi and Internet Access - Ironing & Ironing Board - Alarm Clock, Flashlight, Safe, Telephone with Voicemail - Amenity Kit and Hair Dryer - Dishwasher detergent - Accessibility options include grab bars, lowered counters, a roll-in shower and shower seats ABOUT THE RESORT Hugging the sparkling waters of the Atlantic Ocean, the Daytona Beach Regency features spectacular views of gorgeous beaches, city lights, and sea sights. Its five-star location- right next to all the best Daytona has to offer- is accompanied by world-class services and amenities such as an enormous outdoor heated pool with waterslides, an on-site aquarium and arcade, a private beach and BBQ area as well as exciting surfing opportunities, a volleyball court, and a fun-filled activities center. Try your hand at Billiards or lounge by the poolside, snack, and beach bars with delicious drinks and appetizers. Head over to the fitness center to try out their top-of-the-line equipment then give your tired muscles a deserved break in the luxurious outdoor and indoor hot tubs. 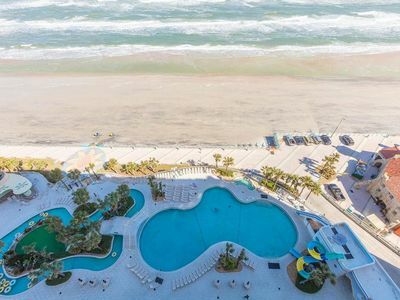 Whether you’re looking to relax and rejuvenate or spend the day making crafts, swimming, and laughing with friends and family, Daytona Beach Regency has all that you need and more right on-site! This property charges a mandatory resort fee due at check-in. Please check listing below for details. Rates subject to change. Other amenities and services offered to guests include: - Indoor Heated Pool - Pool Table - Complimentary WiFi and Parking - ATM and Laundry Facilities - Maintenance Department - Concierge and Guest Services - Maintenance Department - Housekeeping Services (Daily service available for a nominal fee) - Business Center with Copier and Fax - Boogie board rentals and complimentary beach towels - Tiki Bar - Free Internet - Tennis Court - Room Service This property charges a mandatory resort fee due at check-in. Please check listings for details. Rates subject to change. Click "Book it Now" for rates and availability. Warm Inviting 1st Floor OceanFront Unit-Swimming Pool, Underground Parking, NO Drive Bch, FREE WIFI! NEW! 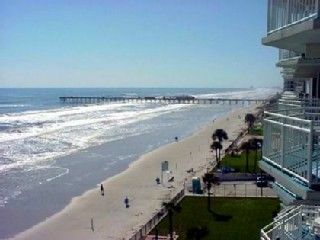 Oceanfront Daytona Beach Studio-Walk to Pier! TOP FLOOR CONDO AT SEA DIP BEACH RESORT, JUST ONE HOUR FROM DISNEY!! !